Abstract: USB 2.0 is the latest standard to hit mainstream integration, and with it comes the promise of Firewire (IEEE1394) like transfer speeds. USB2.0 offers up data transfer rates of up to 480Mb/s, a far cry from USB1.1 which can only support 11Mb/s. While Firewire offers similar data transfer speeds, it is not compatible with USB. USB 2.0 is on the other hand, is backwards compatible with USB1.1, so if you will not have to throw away all your older peripherals. There are still just a handful of USB2.0 products available on the marketplace, but one device which caught our interest recently is this generic USB2.0 External Media Bay. The box actually comes in a variety of flavours, and will no doubt be available under a half dozen manufacturer names, but what it does is actually useful (for a generic media bay anyway). The simple beige box has a small circuit board with an In System chipset that converts ATA66 IDE to USB 2.0. Either a 5.25" or a 3.5" IDE device can be hooked up, and in the case of a hard drive, there is even space at the front for a small (and almost useless) fan. The MAP-K51U generic media bay is rather expensive however, retailing for roughly $110USD. What you get for that price is an internal 120V power supply, the IDE to USB2.0 conversion circuit and a set of left and right RCA audio jacks (in the case of a CD-ROM. 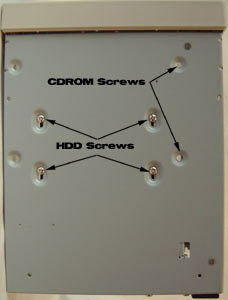 The rear of the box has the power supply plug, a power switch, a small cooling fan, the USB2.0 jack and the RCA connectors. 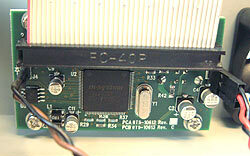 On the inside of the unit are three sets of connectors; an ATA66 IDE cable. 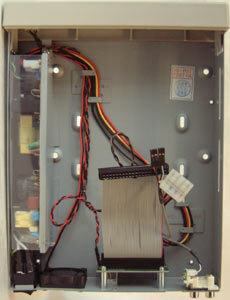 Molex power connect, and audio cables. 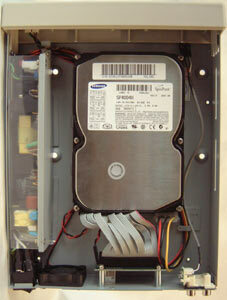 The drive comes with a small pack of mounting screws and some rubber feet. We kind of expected a really cheap locking mechanism, but interestingly, there was none. 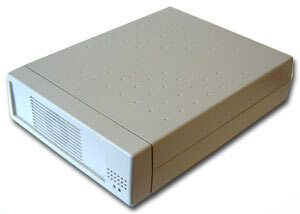 A driver CD is also included with the unit, but Windows XP or Windows 2000 should really just treat the hard drive, CDROM or burner like any other USB device. We set up the MAP-K51U with a 40GB 7200RPM Samsung hard drive and set about testing it briefly to see what kind of numbers we would see. A 1GB file took 1 min 30 sec on USB 2.0 to transfer from the internal hard drive out to the Samsung 40Gb drive, an 17min 45 sec to transfer when the Media Bay was connected by USB 1.1. The difference is quite dramatic, and underscores just how much we're really needed USB2.0. For comparisons sake SiSoft Sandra tested the same Samsung hard drive while connected via USB2.0 and achieved a 11462 Drive index rating. Conversely, with the Media Bay connected via USB 1.1 the Drive index was a scant 974. Bottom line, the Generic MAP-K51U is really expensive, ugly, and remarkably well thought out. The audio connectors on the rear are really nice touch, and the internal power supply is quiet and better than an external AC adaptor. That the Media Bay can accept both 3.5" and 5.25" IDE devices is super, and even though it cost $110USD, its usefulness at the end of a USB2.0 wire is unquestionable. In the vacuum that exists before the flood of USB 2.0 devices arrive to market, the Generic MAP-K51U is an ugly alternative with a lot of versatility that gets the job done.